A technical analysis of the chart depicting gold's rocky ride over the past nine months shows that gold prices have only just begun to break out to the upside. "I like everything about this chart, and I like everything in the macro technical backdrop," Richard Ross, the Global Technical Strategist for Auerbach Grayson, told CNBC last week. 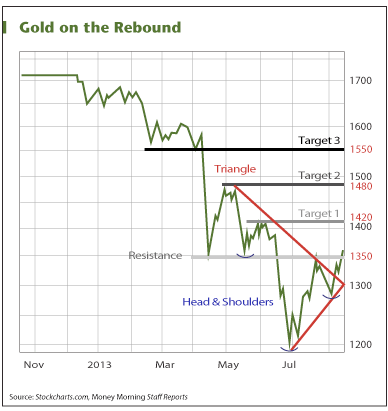 Ross noted that both the triangle and head-and-shoulders patterns in the gold price chart point to a strong bounce. "If we can take out $1,350, which I think we do, we trade at $1,476," Ross said. Helped by a jittery stock market, the price of gold got the push it needed Thursday when it shot up 2.06% to $1,360.90. "The $1,350 level acted as support in mid-April and again in mid-May," said Money Morning Resource Specialist Peter Krauth. "If we can rise above that level and stay there, $1,350 is likely to become support once again." It was only at the end of June that gold prices dipped below $1,200. Despite the pessimism back then, gold has climbed 13.5% in the weeks since. Now investors can use the stair-step down right side of this gold price chart as a guide to where the yellow metal is going next. "After $1,350, the next intermediate target is around $1,420," Krauth said. "Beyond that level, I agree that around $1,480 is the following target. But the biggest prize will be $1,550, which also acted as support from mid-February all the way to mid-April." Abigail Doolittle of the Seaport Group also told CNBC last week that the message of this gold prices chart is unequivocally positive for the yellow metal. "Gold is going higher from here," said Doolittle. "I have a target of $1,488… Above $1,359 you're just going to see gold rocket higher in my view." also diposited in the Bundebank in Germany,but where has the rest of the Gold gone??? Would appreciated some knowledge on this if possible!